As the White House prepares to host French President François Hollande for a state visit, the “freedom fries” era seems a distant memory. In 2003, angered by French opposition to the Iraq War, House leaders changed the name of French fries in three congressional cafeterias (French toast also became “freedom toast”). Still, partisan divisions linger. Two-thirds of Democrats give France a favorable rating, compared with six-in-ten independents and just half of Republicans. Among Tea Party supporters, only 39% have a positive view of France. 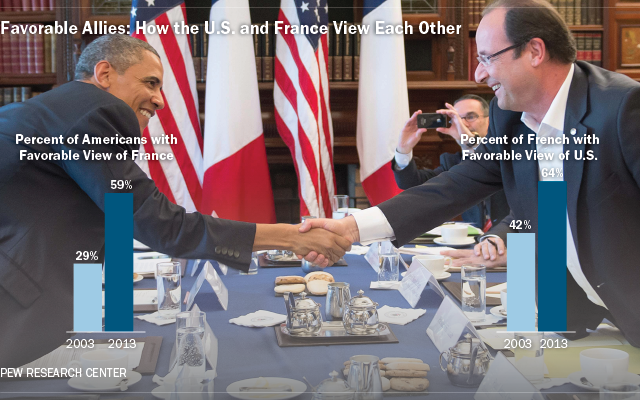 For their part, the French are much more positive about the U.S. than they were a decade ago. In 2013, 64% gave the U.S. a favorable rating, compared with only 42% back in 2003. President Obama, who will host Hollande for a state dinner tonight, is especially popular in France, where 83% express confidence in him. In contrast, just 20% had confidence in President George W. Bush in 2003. The state visit takes place as Hollande deals with scandal in his private life. The French president recently separated from partner Valerie Trierweiler, following allegations that he had an affair with actress Julie Gayet. This may be less of a problem for Hollande than it would be for politicians elsewhere, however, since the French are less troubled by infidelity than others around the world. In a 39-nation 2013 Pew Research poll, France was the only country in which less than half said affairs are unacceptable.